It's almost Samhain, and I know you feel the veil thinning out. 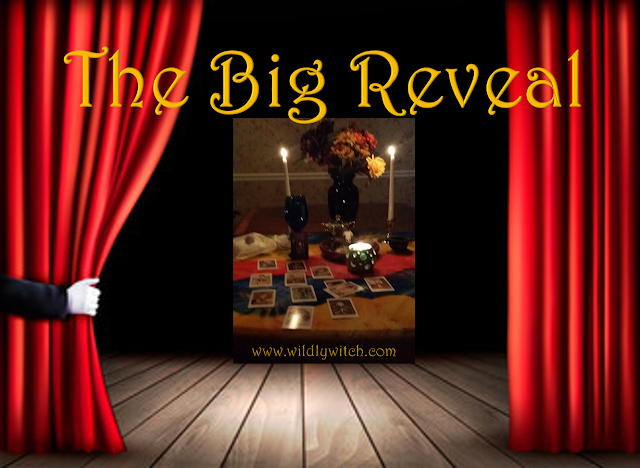 This is a most excellent time to hone your intuitive skills! If you haven't done so, please go to the Facebook Page, and select the card (one only, please) that speaks to you most. If you've already done so, then, let's get going! This week's featured deck is the Tarot de St. Croix by Lisa de St. Croix. The King of Pentacles represents trying to better oneself, hard work paying off, reaching goals, seeing things through to the end, and being proud of your achievements. This Minor Arcana card can represent reaching high social status and being enterprising, resourceful, and principled. As a person, the King of Pentacles represents a mature successful grounded man who is good in business, patient, stable, secure, loyal, and a hard worker. 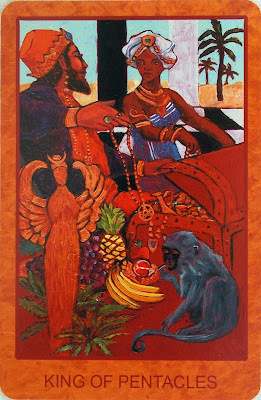 He is a generous provider but is not careless or frivolous with his wealth, and he doesn’t gamble, or take silly risks. He is conservative, and can be stubborn, but, he is also faithful, and a protector. He is a great father, in terms of providing stability and security but, can come across as a bit blunt when dealing with emotional matters as he copes better with practical matters. He may be an Earth sign such as Taurus, Virgo, or Capricorn. Key words: Mature grounded male-energy, successful, wealthy businessman, bettering yourself, not a risk-taker, empire, thriving, high status, stability, security, enterprising, provider, cautious, careful, loyal, faithful, dependable, supporting, encouraging, conservative, principled, reaching goals, hard work will pay off, seeing things through to the end. The Page of Swords represents delayed news, ideas, planning and inspiration. It can also signify being protective, guarded, and vigilant. This Minor Arcana card may be telling you to be patient, to think before you speak, and not to get drawn in unnecessary arguments or conflicts. It can also represent fairness, speaking out, and fighting injustice. The Page of Swords can indicate mental agility, learning, or getting an education, being quick-witted, curious, inquisitive, and using your head. This card can signify being chatty, communicative, truthful, and direct. However, it can also signify being blunt, abrasive, or engaging in petty gossip. As a person, the Page of Swords represents a young person, child or person who is young at heart, who is chatty, lively, quick thinking, analytical, logical and cool and possesses a sharp mind. This person abhors injustice and is a deep thinker but at the same time can come across as blunt, insensitive or a bit of a loner sometimes. In the negative, they can also be a bit of a gossip or deceitful but they do not intentionally cause harm. They like to stick to the rules and may be an air sign such as Aquarius, Gemini, or Libra. 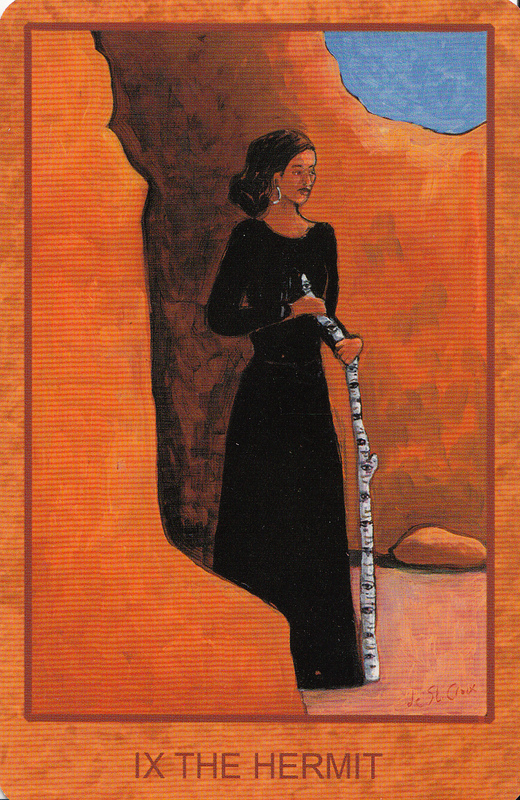 One of the most mysterious cards of the Tarot, the Hermit card generally indicates that you are entering a period of soul searching, self-reflection, and spiritual enlightenment. You may find that you need time alone to gain a deeper understanding of yourself; to remove yourself from the daily grind in order to discover your true spiritual self, contemplate your existence, your direction in life, or your values. The Hermit can also indicate isolating yourself or withdrawing into yourself in order to recover from a difficult situation. This Major Arcana trump card can suggest that you may be going through an anti-social phase, where you just don’t want to interact with people as much as you normally would. The Hermit is wise, mature, and knowledgeable; and may be an indication of someone seeking the services of a counselor or psychiatrist. This is a time to focus on yourself and meeting your own needs. The overall theme of The Hermit is spiritual enlightenment, so now is the perfect time to engage in spiritual activities. Whether it’s meditation, energy work, psychic development, or connecting to your own spirit guides, you are coming into a time of incredible spiritual growth. You may find yourself seeking solitude, or isolating yourself in some respect. However, you should use this time to focus on evolving your spiritual side, and allow yourself to take this time out to listen to your inner guidance, as it will be very rewarding for you. Key words: Spiritual enlightenment, soul searching, self-reflection, introspection, contemplation, inner guidance, solitude. Is it time to get real? Would a practical way of solving problems make sense now? Have a few people recently remarked about how dependable you have become? If these words ring true, your Tarot reading is probably taking place with the Page of Pentacles card being drawn. 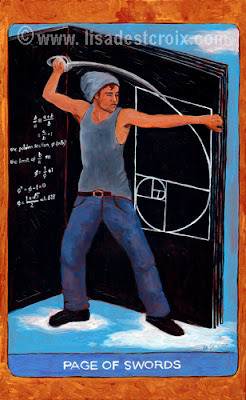 This is a card of seeing the light in all that is practical, and realistic. The Page of Pentacles signals the moment when those who have integrity begin to use this moral backbone to rise, and take charge. As events turn in your favor, the energy of this card creates prosperity commensurate with your commitment to upholding the truth. 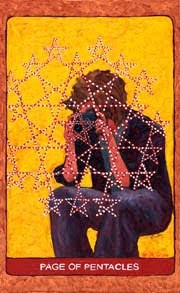 The Page of Pentacles is the bearer of good news in earthly matters such as money, business, education, career, property, or health. It represents making a solid start or laying the foundation for future success. 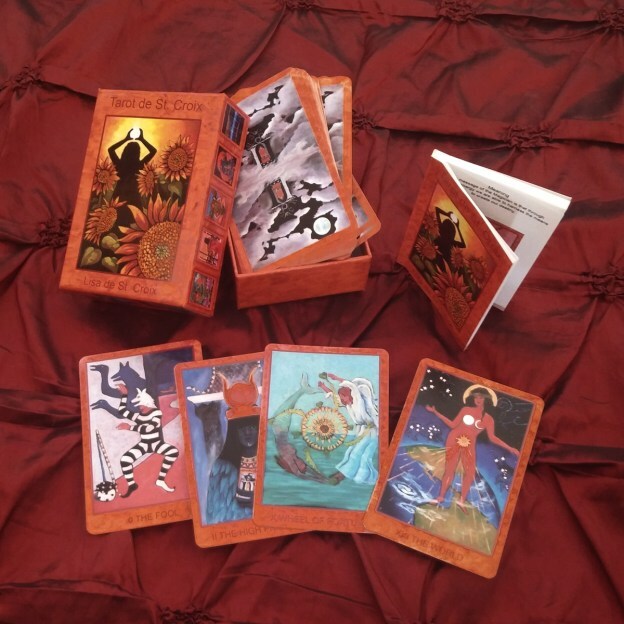 The message with this Minor Arcana card is to decide what you want, and really go for it. Jump in, and seize your opportunities while you can. It tells you that if you make the right decisions now, and put the groundwork in, you will achieve your long terms goals. You may find yourself thinking about your long term future when it appears. If representing a person, the Page of Pentacles represents a young person, child or person who is young at heart, who is grounded, loyal, responsible, dependable and ambitious and who has common sense and excellent future prospects. They may be an Earth sign such as Taurus, Virgo, or Capricorn. Key words: Good news in earthly matters, solid beginnings, setting goals, developing a plan, laying the foundations, taking advantage of opportunities, jumping in, consistency, excellent prospects, excelling in or seeking education/ training, ambitions, decide what you want and go for it, grounded young person, loyal, faithful, dependable, healthy lifestyle, Tarot/ divination, earth magic, nature. How did you do? What insights did you glean that you may want to share? The conversation happens on the Facebook page, so come on back and share! Let me know how I can support you!